Katie Treble, 31, is a doctor from the UK. 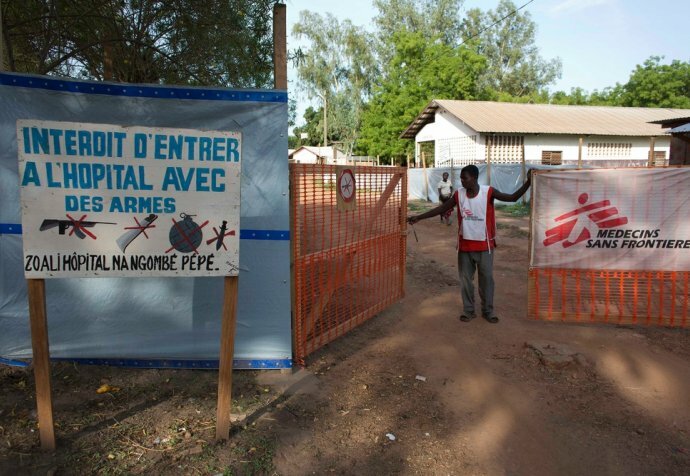 She was working in the Médecins Sans Frontières hospital in Bria, Central African Republic, during the weekend of 24 to 26 March when heavy fighting occurred and Médecins Sans Frontières received 24 wounded people in three days. "The hospital’s small triage area was overwhelmed with patients, all with severe gunshot wounds. They were young men who had suffered injuries to their head, neck, face or limbs, and one man had his intestines spilling out of his abdomen. We had already planned for this situation, but it was my first time dealing with a mass casualty event in real life. The process sounds simple – work out who needs what, when, and keep everything as organised as possible – but in the chaotic reality of an event like this, if order disintegrates it can be the difference between life and death for those who need treatment. My first job was to perform a rapid assessment and assign each patient a colour: red for those with immediately life-threatening injuries, yellow for those needing treatment semi-urgently, and green for the ‘walking wounded’. Black is for those who have already died, or whose injuries are so severe they cannot be saved. "To transfuse all our supply of blood into someone who might die anyway, and leave no blood for anyone else is a tough call to make under pressure"
With all the staff working together we were able to quickly clear a ward to make room for those in the red category. Our surgeon took the first case straight to theatre while we got to work stabilising the others. More wounded kept arriving during this time, so we had to shuffle the order of those in the queue for the operating theatre. I was nervously keeping an eye on the blood bank – Bria is a small hospital with very limited supplies, and we didn't know how many more patients we could anticipate that night. To transfuse all our supply of blood into someone who might die anyway, and leave no blood for anyone else is a tough call to make under pressure. One patient who stood out for me that weekend was a three-year-old girl. She had been shot in the hip and was carried in by about 15 members of her family. She was incredibly calm, and lay quietly, not crying, co-operating with us even though she couldn't understand why we wanted to prick her with needles and keep touching her painful wound. The atmosphere throughout the whole weekend was one of eerie calm; a lot of people here have seen this sort of thing many times before, and panicking just doesn't seem to be something that anyone does anymore, not even the children.